Underglazes are decorative colours applied to ware before the application of glaze, or they can be put over glaze (prior to firing), they can also be considered as a “paint for clay”. Refer to our fact sheets for Colour Decorating and Colour Application Techniques. Cesco Underglazes are concentrated underglaze stains in a beautiful flowing brushing medium. They are fully ball milled, lead free and non toxic. 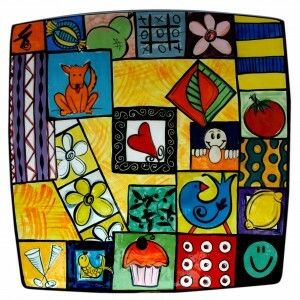 They all have a high percentage of stain, giving strong reliable colours when fired at either earthenware or stoneware. There are 32 colours with a silky smooth application which are bottled ready to use OR they can be extended with FK110 Colour Extender or water and will still retain good colour intensity. Adding FK100 Flux Extender turns them into beautiful colours suitable for majolica decoration. 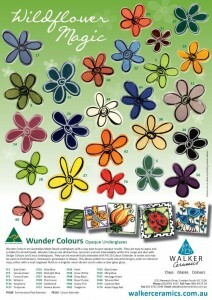 They can be intermixed within the range and also with Wunder Colours and Design Colours. To view our full range and sizes available visit our Online Shop. 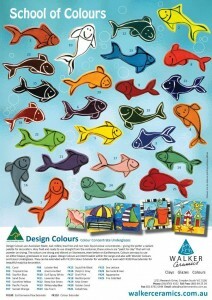 Design Colours are ball milled, lead free and non toxic. With Design Colours you can decorate with confidence as all colours reflect the final fired colour except for FK21 Cobalt Sea, which appears mauve in the bottle but actually fires to a deep, vibrant blue. This means you can use your creativity and decorate your work trusting your eye. The technical expertise of our ceramic engineers and laboratory staff has enabled us to provide the ceramic industry with Australian made, lead free, liquid colour concentrates of the highest standard. This range has numerous decorative applications that can give effects from opaque to translucent. 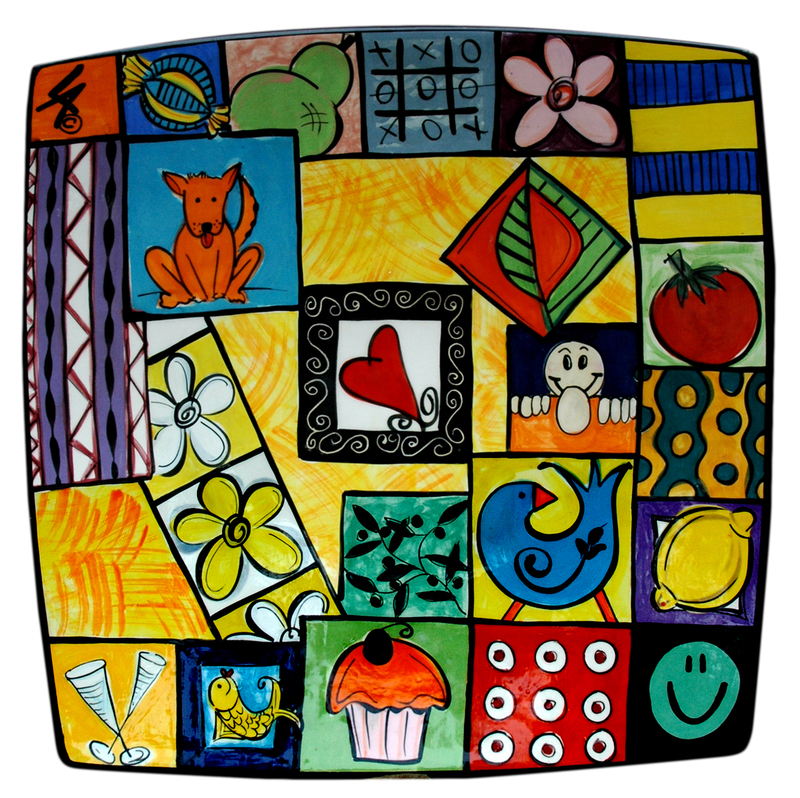 Magnificent vibrancy on stoneware – even better on earthenware. 25 ball-milled colours – the STRONGEST ever developed. 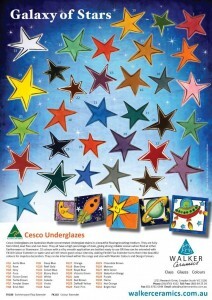 All colours are completely inter-mixable within the range or with our range of Cesco Underglazes and Wunder Colours. Ready to use, or economize with our specialist Extenders: FE100 Flux Extender for majolica and special effects and FE110 Colour Extender for all temperatures. Several years ago, potters began asking for lighter, brighter colours. Gone were the browns, they wanted colour in their lives and pots. But the problem was that “pastels only” was the norm and even they were limited to earthenware temperatures. There was no such thing as Orange, Red, Pink or Lime Green at stoneware temperatures. Then Walker Ceramics sent me a range of their new Design Colour Concentrates for my evaluation. I wanted long, flowing strokes, without losing colour, good absorbency on bisque and colour that doesn’t rub off. Was I asking too much? NO! I started testing and found they all fired to 1300°C without fading, except No.6, No.9 and No.11.Brush strokes were silky, fluid and long. I was able to develop tonal changes just by more or less pressure on the brush and best of all I could extend using Walker Ceramics specialist Flux and Colour Extenders without loss of colour. Colours don’t rub off, resulting in ease of glazing; glazes are smooth and mature with no crawling. The lack of clay in the colour makes them very suitable for majolica. Specialist glazes are available to suit your clay and temperature range.Altogether I feel most excited about these colours. Design Colour Concentrates are the answer to many potters, including me, wanting versatility and brilliance of earthenware and stoneware colours. Wunder Colours are clay based, lead free underglazes of the highest standard and are the result of intensive development and testing. Wunder colours are opaque, brush on colours, very easy for beginner or professional to use, whereas Design Colours are a pure colour concentrate giving brighter, clearer intense colours at both earthenware and stoneware. Economize with our specialist Extenders – FE100 Flux Extender for Majolica and special effects and FE110 Colour Extender for all temperatures.